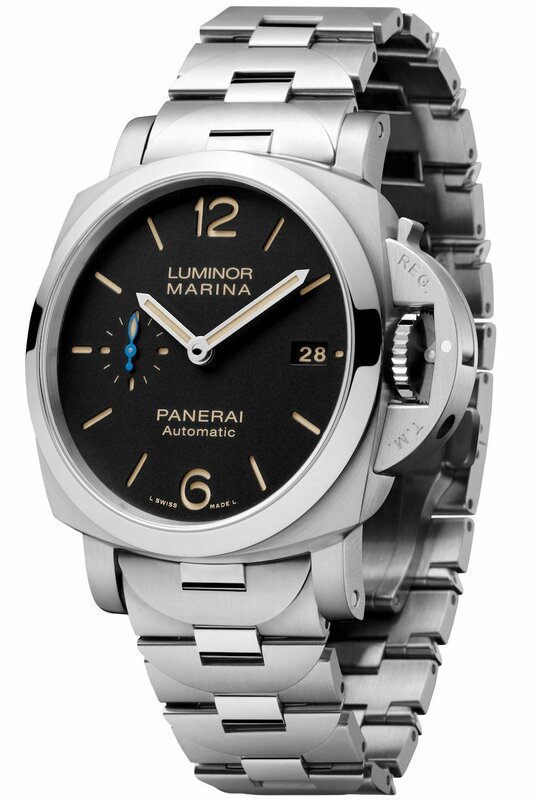 Officine Panerai, the underrated Swiss-Italian watch brand with a military history, has just unveiled a new Luminor model. It is a tribute to one of its classic pieces from the early days of its availability to the general public. The Luminor Marina 1950 3 Days Automatic Acciaio is a handsome bit of kit based on the first watch to feature a steel bracelet in 1999. Available in both 42mm and 44mm case sizes, the links on the throwback steel bracelet feature an all-new design based on the “bridge” piece found on Panerai’s iconic locking crown guard. In a bit of ergonomic showmanship, each of the links on the new bracelet, which is polished in contrast to the brushed finish of the watch’s case, integrates perfectly with the rest, without the use of any screws. 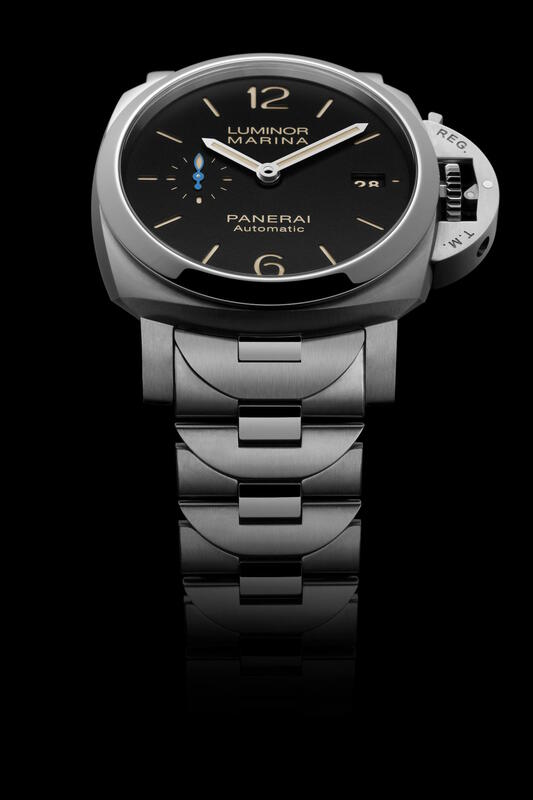 Let’s take a more detailed look at the watch by Panerai. Water-resistance is guaranteed to 10 bar (or about 100 metres) for the model with a case 42 mm in diameter (PAM00722) and to 30 bar for the 44 mm model (PAM00723). Not everyone is fond of the steel bracelets on Panerais, which we tend to think look better on the iconic rubber diving strap supplied with each model or on classic saddle leather straps which give the watches more of a vintage feel. 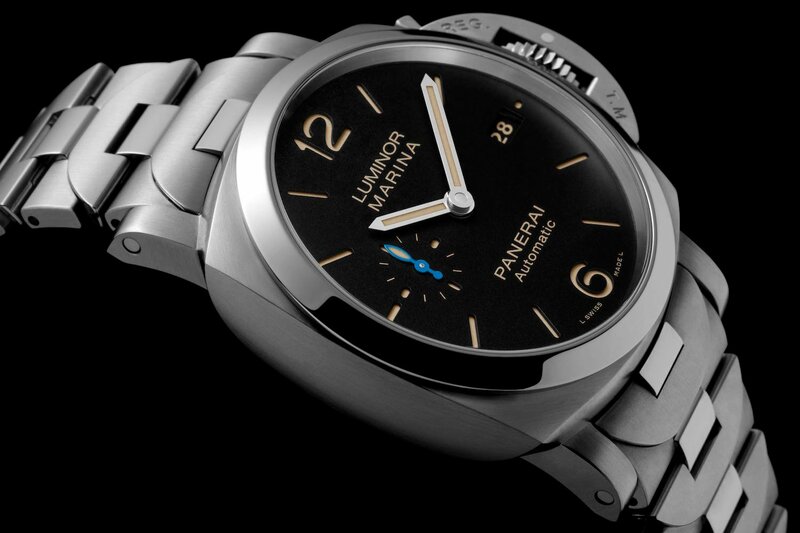 The bracelet can easily be replaced thanks to the system patented by Panerai which uses a little push-button under each lug, operated by using the special tool supplied with the watch. As the rubber strap is definitely a more casual look, the steel bracelet is bound to have its fans, especially given the new lightweight construction. A handsome piece no matter how you wear it. While just as strong as any other steel bracelet produced by Panerai, this one is also significantly lighter, adding to its comfort and wearability. The case is also lighter and slimmer than other 1950 models thanks to the newer 6mm thick automatic P.9010 calibre movement, which is clearly visible through the sapphire crystal exhibition window or “porthole” as Panerai likes to call it, set into the back. 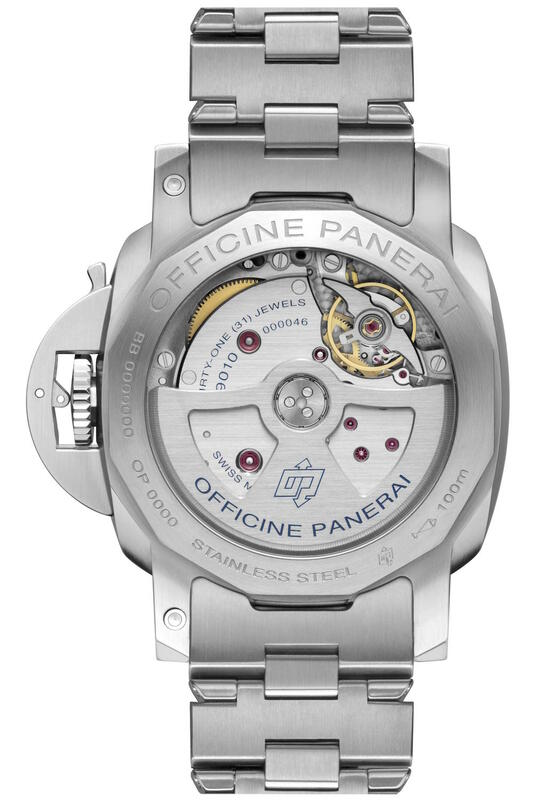 Made entirely at the Panerai Manufacture in Neuchâtel, the movement has a power reserve of three days and is wound by a bidirectional oscillating weight. The signature Panerai sandwich dial is classic black with large luminous beige markers and a seconds counter with a small but distinct blue hand at 9 o’clock. This last feature is one of the subtle ways Panerais modern pieces differ from their older siblings.